This spring we held a competition for members of our Department to produce images that could adorn the walls of Level 6 in the West Wing of the John Radcliffe Hospital, where most of our staff are based. 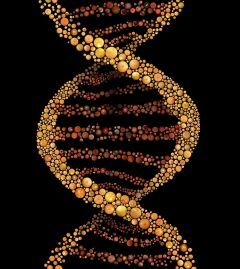 Jonathan Brett (Nuffield Laboratory of Ophthalmology): This image uses different colour photographs of the retina which are positioned in such a way as to represent the structure of DNA. 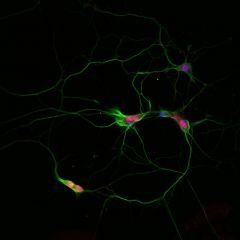 Malte Kaller (Division of Clinical Neurology): Induced pluripotent stem cells, generated from adult cells via genetic reprogramming, were used to differentiate human sensory neurons (Green). To study an important cellular interaction, these neurons were co-cultured with Schwann cells, which wrap around axons to form segments of myelin (Red). Cell nuclei were visualised in Blue. 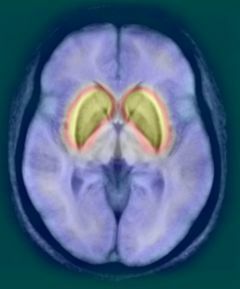 Ludovica Griffanti (Wellcome Centre for Integrative Neuroimaging): Multimodal imaging techniques are used in the OPDC to study the structure (magnetic resonance imaging, underlay) and function (nuclear imaging, colored overlay) of the brain in subjects at risk of developing Parkinson’s disease. We aim to detect early changes (before symptoms occur), which may be used to predict disease progression. Maria Patricio (Nuffield Laboratory of Ophthalmology): Choroideremia is an inherited retinal disease that affects one in 50,000 people worldwide. 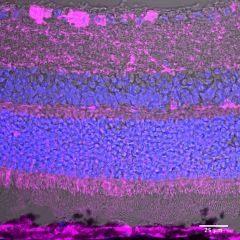 A recombinant virus tested pre-clinically in Oxford shows a healthy copy of REP1 can be delivered to all mice retinal layers. A multi-centre phase 2 gene therapy clinical trial for choroideremia using this virus (rAAV2/2-REP1) is currently ongoing. 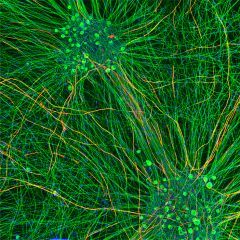 Emily Feneberg (Division of Clinical Neurology): This is a confocal microscopy image of neurons responsible for motor function. 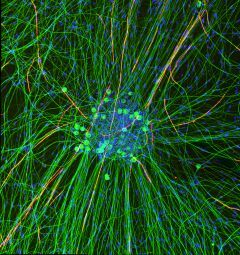 These motor neurons were cultivated and differentiated from pluripotent mouse stem cells. Motor neurons typically show long axons which branch out in order to make contact with other neurons. Alex Clark (Division of Clinical Neurology): We have developed a coculture system whereby human iPSC-derived sensory neurons can be myelinated by rodent Schwann cells. These cocultures can be kept for over a year and express all the biochemical hallmarks of mature myelination. Abundant MBP (red) positive internodes can be observed wrapping the Neurofilament (green) positive axon. Sukrat Arya (Division of Clinical Neurology): The neuromuscular junction (NMJ) is the site of communication between motor nerve axons (green) and muscle fibres (red). The function of the NMJ is to transmit signals from motor neurons to the skeletal muscle fibres, to ensure precise control of skeletal muscle contraction and therefore voluntary movement.